In this post, we examine 5 of the best-selling tray tables. Tray tables are portable tables which are used by people to eat while watching TV, eating in bed, or to use for occasions such as parties or picnics when extra table space is needed. In addition, they can help accommodate elderly or disabled individuals eat their meals. Some tables fold while others don’t. Set your table down in the desired location and set drinks and food on it. Use them for TV watching or for picnics. While most of these types of tables are meant to be functional, there are some people who use them as decorative pieces throughout the home. When using a piece like this as a decoration, experts recommend sticking to a solid color, which more easily pairs with a variety of paints and other decorations (Source). In this article, we look at five brands of affordable tray tables and compare their features. The Lincoln Home Decor set is a faux marble pattern with brown as the dominant color. This set comes with the tables and a storage stand that’s easy to move out of the way. These tables are made from sturdy wood, and buyers praised them for their good looks that fit into a variety of modern decors. The next table we looked at is the Lifetime 80251, which is a folding laptop table/TV tray. This tray is adjustable to 24”, 26” and 28” in height, which makes it perfect for children and adults. Unlike the Lincoln set, this is a no-frills, bare-bones table that features a plain granite colored polyethylene top, which, while not aesthetically pleasing, it is durable and suited for both indoor and outdoor use. The PJ Wood table set is a five-piece set in a beautiful natural wood design that will fit well into almost any decor. The tray is made from solid plantation wood and the tables fold easily for storage when not in use. Speaking of storage, this set comes with a handy storage rack. With this set, you get four tables plus the rack, which is a good deal for the price (Source). Next is the Greenco bamboo breakfast/serving tray. This tray is perfect for eating in bed or for using as a laptop stand in bed. It’s made of durable natural bamboo and features folding legs, which make for easy storage and carrying. Also, the natural bamboo makes this tray a unique, versatile and decorative piece that can be used for more than serving food (Source). Last up is the PJ Wood single tray, which is a solitary table that comes in a distinct dark mango color that will compliment most modern decors. Like the previous PJ Wood table, this one is also made from solid plantation wood and is sturdy. Also, like the previous table, this one folds up quickly for easy storage. This piece also makes for a nice decorative table to sit plants or other decorative items on. This TV tray offered by PJ Wood is well-made, well-designed, and an excellent choice if you love to eat snacks while watching movies and shows. Users love the color and the size, but some do note that they received a damaged unit. 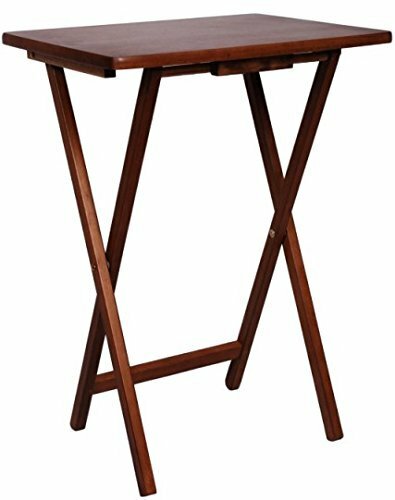 The PJ Wood tray table measures 19.1″ x 14.57″ x 25.98″, and it’s made from solid plantation wood painted in dark mango. What’s great about it is that it comes fully assembled so that you have to unpack it and you’re ready to go. 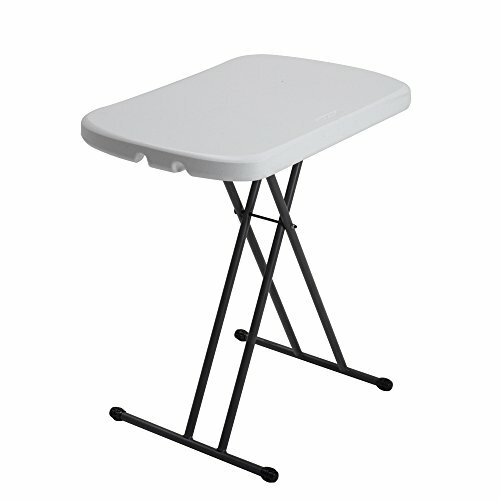 Another excellent feature is that it folds and the flat surface cleans easily. In general, users have a favorable opinion of the PJ Wood foldable TV stand, and they agree that it does a nice job. A reviewer comments that it folds smoothly and that you can store it almost anywhere because it doesn’t take much space. He adds that he likes the design and that it will hold light things like a bowl of popcorn with no issues. Another user mentions that the product looks better than she expected and that she has been using it for some time with no complaints. A buyer also recommends it as one of the best cheap TV tray tables and states that the size is perfect for any living room. However, a couple of customers have noted that the stand is wobbly and doesn’t latch when unfolded. They also point out that the surface is too rough. 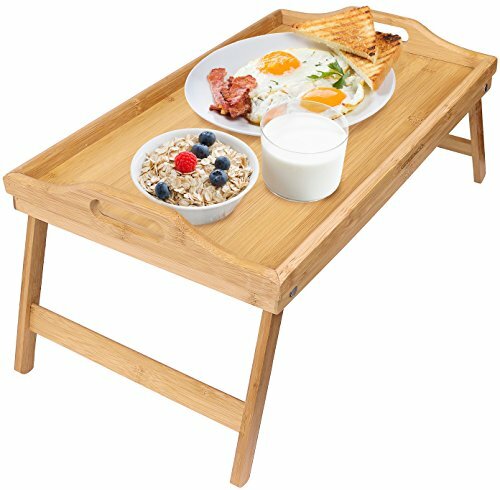 If you are wondering what to use to serve breakfast in bed, you might take a look at this foldable breakfast tray offered by Greenco. Users love the design, but some do note that the handles are not well attached. The Greenco bed table is made of bamboo for durability and strength, and it measures 20″ x 12″ x 2.5″ when folded. Another great feature of this product is the surrounding lips, which prevent objects from falling over in addition to the two hollowed handles, which are convenient for carrying it around. What’s more, you can clean it easily with mild soap water. The manufacturer recommends that you use bamboo oil to extend its life. As a whole, users have a high opinion of the Greenco foldable tray, and they highly recommend it as one of the best TV trays available. A reviewer comments that she is satisfied with the quality of the product and that it’s light and comfortable to use. She adds that the legs are stable and that the top is smooth and cool. Another buyer observes that the surface is spacious enough to hold an entire meal and that the product is far sturdier than she initially expected. However, a few customers have noted that the product is not as durable as they expected and that it cracked too quickly. They also complain that it’s cheaply made and that the legs don’t stay in place. This set of tray tables offered by PJ Wood is affordable, convenient, and an excellent addition to any living room. Users love the price and the colors of the tables, but some do note that it’s not what they expected. The PJ TV tables are made from solid wood for durability, and the set includes a stand with four trays measuring 19.1 x 14.6 x 26 inches. Another great thing about this product is that it folds, which makes storing it easier than ever so that you don’t have to worry about space. However, keep in mind that the stand requires assembly. A customer mentions that the TV table trays seem sturdy and well-made and that the workmanship is of good quality. However, he observes that the design has some flaws because he can’t get his knees under the table. The reviewer states that the distance between the legs should be wider to accommodate adults. Currently, he has to keep one of his legs outside the table to make do. He recommends that you take a look at the measurements before buying. If you’re looking for a highly rated TV table to match your living room, you might take a look at this one offered by Lifetime. Users love that they have three adjustment settings – 24”, 26”, and 28”, but some do note that it’s not as easy to adjust as they expected. Lifetime folding TV tray measures 26” x 18” x 28”, and it’s made of high-density polyethylene for durability with powder-coated steel frame. Another great thing about this product is that the top is UV-protected and stain-resistant so that you can use it indoor and outdoor with no worries. In addition to this, you have a 2-year limited warranty, and you can choose between 26” and 30” model. As a whole, users have a high opinion of this portable laptop table, and they praise its design, sturdiness, and durability, and they don’t have any major complaints. A reviewer comments that the product is more stable than she expected due to the scissor-style legs and that the size is perfect for a living room. She adds that the tray table holds her sewing machine with no problems and that she highly recommends it. Another buyer mentions that it folds easy and that the locking mechanism is well-designed. A purchaser also observes that the craftsmanship and quality are exceptional and that it’s ideal for small spaces. However, a couple of customers have noted that they find it difficult to open, adjust or store the table. This TV tray table set offered by Linon is well-made, elegant, and an excellent choice if you don’t have enough space in your living room. Users love the faux marble color, but some do note that they received a damaged set. 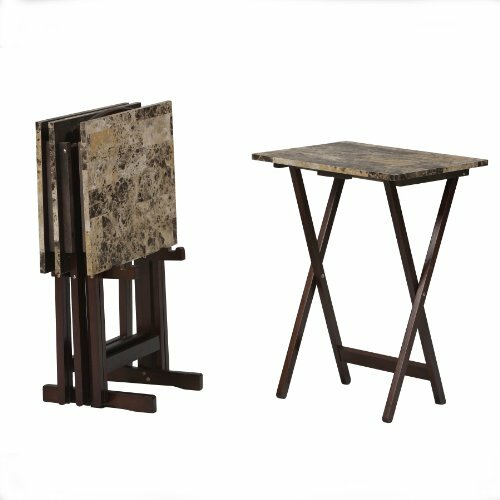 The Linon tray stands feature a sturdy wood construction completed with a faux brown marble top with elegant design. The set consists of four foldable trays, each measuring 19”x 15.75” x 26.25” and one stand. Another great thing about this product is that you can move it easily from one room to the other thanks to the handle on the top. A reviewer comments that she is very impressed with the design and the color of the tables and that they match her décor perfectly. She adds that they are holding pretty well even with heavy use. Another user mentions that the rack is easy to assemble and that it takes no more than 10 minutes. A purchaser also observers that you have plenty of surfaces available and that the trays don’t wobble. He highly recommends them as one of the best affordable TV tray tables. However, a couple of customers have noted that the tables are cheaply made and that they don’t last long. They also point out that the stand is flimsy and that it arrived without the necessary hardware. We took a cruise through Reddit because we found a variety of topics that didn’t have a lot of consumer feedback. In particular, we were looking for information on snack tables, DIY alternatives, accent tables, and metal options. Over in the male living space subreddit, one User submitted an image of an inexpensive mid-century planter that you can use as a tray table. It comes from Ikea. In essence, it is a minimalist looking planter that you could use as a footstool or de facto surface if you are eating in the living room and need a small dining area for your take-out food. Wikipedia also had some interesting information. 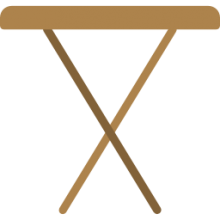 They say that these collapsible tables frequently go by other names like personal table, TV dinner tray and generally provide a small, maneuverable collapsing table surface. No one actually knows who invented them, it turns out. Initial designs consisted generally two separate pieces. There would be a metal surface that would be gripped on its underside buy a pair of tubular legs that had rubber, skid-resistant tips on their bottom. These were initially popular with the surging use of televisions- providing a cheap and convenient way for families to eat in front of the television, perhaps enjoying a Sunday evening movie. Over at Amazon.com, you’ll see that there are a variety of different styles you can choose from- one that we thought was particularly attracted was provided by Essential Home. It’s made of wood and it marketed as a TV tray snack dinner folding table set. One buyer who has a small apartment said that he purchased it to have a place to position his drink while he is sitting on the sofa enjoying late night literature reading. A parent also said that they purchased a couple of them to accommodate mealtime in front of the television with their children. Surprisingly, the kids haven’t knocked over the tables – which would be a disaster because all of their meals sit precariously perched on top of them. Another unique design is the bed tray – this it’s a lot lower, and obviously will spread out across the lap of someone in bed. This can be helpful for the elderly, disabled, or people that like to have breakfast in their bedrooms and get a little bit of work done on their laptops. Indeed, it is marketed as a breakfast tray – providing an easy to clean surface, notched handles and an attractive design that likely will complement most household interiors. One reviewer who analyzed this style said that in particular, it’s cheaper than a lot of other big name brand options. He also is satisfied with how easy it is to wipe clean because of its melamine surface. Because the legs retract and fold up, it’s really portable. The minimalist design makes it easy to match with bedroom aesthetics. Another interesting design we saw was a table with L shaped legs that you could pull towards you while sitting on the couch, and the legs would go beneath the sofa with table tucked snuggly up against you. As opposed to other models that you have to lean forward and over to use, this model presses up tightly against you, making it easier to eat food. This could be extra convenient if you had an elderly loved one living with you who doesn’t have the strength or ability to lean forward from a sitting position. Be careful, however, make sure you read customer reviews prior to purchasing because some of these models do feature a nasty forward slant that you can’t fix with adjustments. Another issue is that you’ll want to measure the space between the floor and the bottom of your sofa to ensure that the legs will fit below your couch. One reviewer said that they take care of their elderly mother who has an especially tiny frame- this makes it easy to serve her meals. Another remote worker praises the design saying that she’s able to work on her laptop in the living room- getting work done from a comfortable location. Another user who would undergo on hand surgery said that they purchased it because they can maneuver it back and forth with their feet. In addition, once they’re healed it’s a convenient place to situate a laptop and get some typing done – though she does say these models can sometimes wobble a bit.